A poster is your way to appreciate arts, artists, a hero, and sometimes comic characters. This Justice League poster, eye candy of any geeky room, is a little bit different than most due to the way all characters are drawn. It does not clearly show the face of your heroes, so you are free from associating it with actors and actresses. Overall dimension measures at considerable 34” H x 22” W, so it should cover a lot of wall space in your room. One of the best things about it is that it does not prominently show actors’ actress’ faces behind the masks of superheroes. Batman is Bruce Wayne, not Adam West. Green Lantern is Hal Jordan, not Ryan Reynolds, etc. This bowl will be a big hit any time you’ll invite over anyone who has some feelings toward Star Wars (and let’s face it, it’s a decent chunk of our planet’s population). It’s available in a shape of Chewbacca, Jabba the Hutt and Wampa. I can promise you with the probability of 99% that you’ll be smiling out whenever you’ll grab a handful of popcorn or any other snack of choice from this bowl. And it will bring up the nerdy fleur to your apartment. If besides of Star Wars you also happen to love sushi than I have good news for you: from now on any Japanese themed feasts at your place can quadruple its awesomeness with this chopsticks. Its colors are super bright, and the ON/OFF button is a smart function for preserving the life of the batteries. Solid and well made, they come in a lovely gift box. And even though they are more than affordable, they look well made. Are you ready to fight for the last piece of marinated ginger? The innocence, the charm, and the respect for the universe are all things that set Hayao Miyazaki films apart. The music, the script, the dialogs, the characters – it’s like all the most talented people in the world came together to make those. And Spirited Away is by far one of the most loved of Miyazaki’s works (both by nerds and the rest of the humanity too). No Face (Kaonashi) is the one who makes me think a lot. There probably can be too many meanings, but for me, it’s quintessential of what’s wrong with modern culture. We are all social beings, and we often succumb to the demands and the emotions of those around us. And sometimes we are just turning into monsters eating lots of food and consuming tons of other staff. So, this piggy bank is a great reminder about all the brilliant ideas that Miyazaki is sharing with us. Plus it’s quite practical. Even during the era of digital money, I am still struggling with keeping the change in a neat order. At the moment of writing it’s just $14.19. There ’s nothing new about robot vacuums anymore. We know that those are amazing and eliminate the obscure necessity of manual vacuuming entirely. However, what’s fresh is the possibility to pimp up your hover at super low cost, turning the boring device into a cool geek room decoration piece. Those protective stickers come in various colors and work for Xiaomi Vacuum Cleaner. (For those who missed our post on best cool gadgets for men I strongly recommend to read it too, since I talk a lot about Xiaomi there). Yes, in reality, you can’t only own the stickers you also have to purchase the vacuum, which currently costs $255.99 here. But hey, if you still haven’t bought the little robotic helper, maybe those stickers will be a huge selling point for you. On average the robot vacuum can be purchased on Amazon for anything from a few hundreds of dollars like this no-name basic one to something worth thousands of dollars like this one. So $255.99 is a great price, given that Xiaomi is indeed a brand of terrific quality. This particular vacuum has all the blows and whistles of way more expensive models. It’s noiseless; its tech is impeccable (SLAM – simultaneous localization and mapping – very impressive). It also has 12 types of sensors such as the ultrasonic radar sensor, gyroscope, cliff sensor, etc. And now you also can customize it and boast with the coolest looking vacuum ever. Sometimes geeks also like plants. Or at least they enjoy an occasional source of oxygen and calamity in their apartment. For them, this flowerpot will be a gift sent from heavens. It looks sleek, and it’s functions are countless. If you put an actual plant in the pot and will be touching its leaves later on the device will burst into various sounds like as if leaves were piano notes. The pot is also a Bluetooth speaker with the atmospheric lighting following the base of the music played. And it has a night like a mode to soothe and relax you before you fall into sleep. At the moment of writing the price for this technological miracle is just $12.99. Pro tip: Item’s seller, Geekbuying.com, is running various promotions all the time. So, if the price is slightly different, bookmark this page and check on the items you liked in several days. Not much to say about this bulb – it’s just amazing. Can be an easy and cost efficient way to add more coziness to any geeky room. On top of its obvious esthetical perks and more than affordable price it also will work on lowering your electricity bills – it’s saving up to 90% more energy than an incandescent bulb. At the moment of writing it’s just $4.99. Adoration for comic books is one of the essential traits of any geeks. And, well, what’s not to like about it? Punchy characters, exciting twists in the plot and most of the time great costumes and superheroes’ symbols. So if Captain America is amongst your favorites, consider this wireless charger as a legit geek decorating idea. It supports various devices from iPhone and Samsung to LG, Nokia, and Motorola. It’s super slim and looks REALLY cool. Children need to eat a lot, but they only want to eat as little as they are allowed. For them, playing with toys is more important than having breakfast. Sometimes adults are the same way. And constructive eating utensils thankfully has the right answer. It is a combination of toys, plates, forks, spoons, and food pusher to make meal-time great again. All materials are FDA approved; they are free from BPA, Lead, Phthalate, and Paint. The idea is good. You may also imagine yourself being a construction worker while eating and using those utensils. That can be a nice imaginary career move that can be a good thing for the sake of variety. If you open a wine bottle, you might as well drink it all unless you want the drink to go rancid. You can avoid this with an excellent re-sealing system. Among many available out there, this one is distinguishable and useful at the same time. The top portion of the stopper is molded in the way that it resembles Death Star straight out of Star Wars. The actual part that closes the bottle creates a tight seal to keep your wine tasty and fresh, even after you open it. And even though wine enthusiasts and Star Wars fans sometimes may not get along well, this wine bottle stopper will change that paradigm. Claim your geekiness and fondness for Einstein and universal laws of physics with this shower curtain. It’s easy to install (comes with ring hooks) and looks very sophisticated. Who said that only room should exude nerdy vibes? The bathroom can do that too! What else should be on the list of favorites of a real geek on top of comic books? Ordinary books, of course. And this uncommon bookshelf combines those two passions. Therefore both superheroes fans and book lovers can’t remain indifferent to it. Looks dope and gives a feeling it is floating in the air, and the superhero character seems to stop the books from falling. 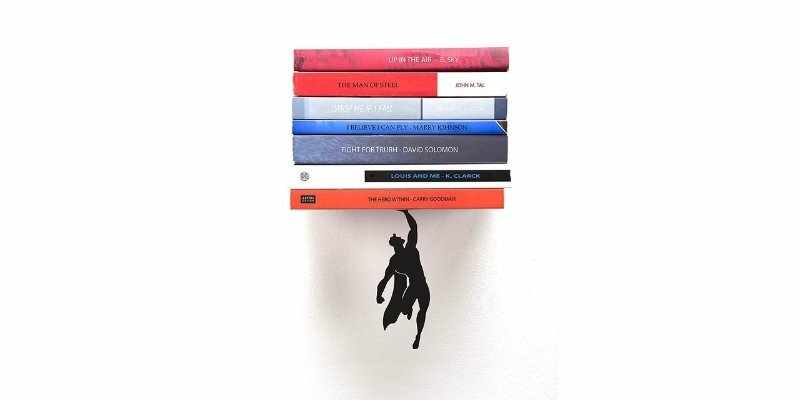 Although this Superman is quite stunted so maximum weight the shelf holds is 3.5 kg. But maybe you might need a couple of those? Problem solved! It is indeed a word clock, not a world clock. The name says it all because the clock is displayed in words instead of numbers or revolving hands. It measures 8 square inches and is best for a table clock. It comes with an AC adapter, so you don’t have to worry about replacing batteries now and then. Every word that corresponds to the current time is highlighted. This clock is a perfect example of “form over function” design. It is an excellent geeky thing to stand on your desktop, and maybe you can give it to your nerdy kids once you’ve learned how to read time on a regular clock. Waffle makers are common kitchen appliances. And most of the times you probably will not find anything substantially different in their looks. Materials and shapes can be different, but the results are more or less the same with slight differences. ThinkGeek has come out with something unique with BB-8 waffle maker. It works like any other typical waffle maker, but your breakfast will be in the shape of a Star Wars Droid. It comes with a type-B socket, so it works with a standard American power outlet. The force is strong with the waffle. Internet-connected clock makes your space different with beautiful clock appearance, controls smart home in a glimpse, follows digital metrics in real time, creates a music-charged environment with the dance of pixels. It’s the ideal size for a bedside table or any other place at your home. It works like a charm, all of the apps you might want to install ( (Instagram, FB, Twitter, Youtube, etc.) will work flawlessly as reported by avid users it’s a breeze to set up. It does what a real geek wants. It’s an extraordinary map for nerdy travelers to map out the next (or the past) adventures. And it comes with a free set of push pins designed precisely for that. The piece will be the focal point of your dining room, living room, office, or about anywhere else you could think of! A minimalist design with grunge vibe! It’s inspired by scratched slate, old blueprints, and contemporary boldness, while still presenting up to the date information. It is a classy way to remind you of where you have been and where you are going in life! And a great conversational piece also. Any visitor of your geeky room would be grilling you with questions about your adventures, and it will be easy to keep the stories coming thanks to this map. At the moment of writing its just $109 for the standard size map (24*16 inches). And you can even personalize it for extra $20. How about a stunning audiovisual light show in your home any minute you want? That’s when Nanoleaf Rhythm comes in play. The Rhythm module identifies music, so the panels change color in time with the rhythm, and you can also use the app or voice control to build your shows. While the utility of the item might seem like a gimmick, “visualize your music” (especially considering the price), it does work and brings a new dimension to the music you listen. So if you want a colorful well built, and hypnotic lighting system that will add a new layer of stylish nerdiness to your geeky room this item is perfection itself. The whole idea about the nerdy home decor is that it beautifies your place, makes you feel comfortable, highlights your personality along with the interests and also it’s very functional. So, I hope you found something you love on the list. And maybe even planning in your mind where exactly you will put it and how your guests will react to it. Whatever this item is I am sure you’ll have lots of fun with it.